In 2011, the Aerolites’ Victor Veve and Jeremy Harple holed up in a Los Angeles studio with some big-name rock talent to record what would become their band’s self-titled debut. They returned from the left coast with cool stories about working with, among others, the Allman Brothers’ bassist Oteil Burbridge and drummer Kenny Aronoff, a well-traveled studio drummer best known for his work with the Tedeschi Trucks Band. A song from that record, “Electric Cigarette” was placed in a Dennis Quaid flick. There were rumors of major-label interest. The Aerolites, it seemed, were on their way. But then a funny thing happened. 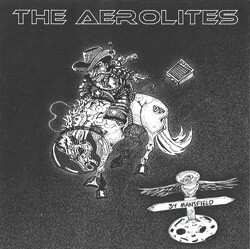 The Aerolites (the album) remained on the shelf. Aside from a story on the band in this paper prior to a release that didn’t happen, there was virtually no evidence it even existed. Seven Days would review the record a few months later, but even then it hadn’t been officially made public. The album has since appeared on the Aerolites website, but it did so with essentially no fanfare. Flash to the present. The band has recently reemerged with a new record, 34 Mansfield. In place of heavyweight session players, Veve and Harple are flanked by their local bandmates, including guitarist Micah Sanguedolce, bassist Ian Wade and Death’s Dannis Hackney on drums. Instead of a glitzy, la-la-land studio, the record was tracked in Harple’s old Cambridge house at the titular address. It is, in every sense, a homecoming. The band’s debut, for all its star power and slick production, very much felt like, well, a slick, star-studded production. And maybe that wasn’t a good thing. As 34 Mansfield reveals, part of the Aerolites’ appeal stems from the band’s rough-hewn charm. Harple, especially, is a gifted but unusual songwriter who benefits when his witty, unconventional style is matched by equally off-kilter arrangements. When you buff away the imperfections, you lose the essence of what makes him, and ultimately the band, great. As on their debut, on 34 Mansfield the Aerolites rarely shy away from their influences, including the Allmans and Derek Trucks, among others. But that doesn’t mean they need to be those bands. 34 Mansfield outshines its predecessor precisely because the Aerolites were left to their own devices to forge their own take on Southern rock and jam molds. And they did, delivering a lively, surprising and well-crafted record that is far more Hardwick than Hollywood, and blessedly so. 34 Mansfield by the Aerolites is available at theaerolites.com.